HIGH QUALITY: GOBAM makeup organizer is made of 100% PREMIUM ORGANIC BAMBOO, the finest bamboo quality that follow four key components: strength, density, durability and eco-friendly. 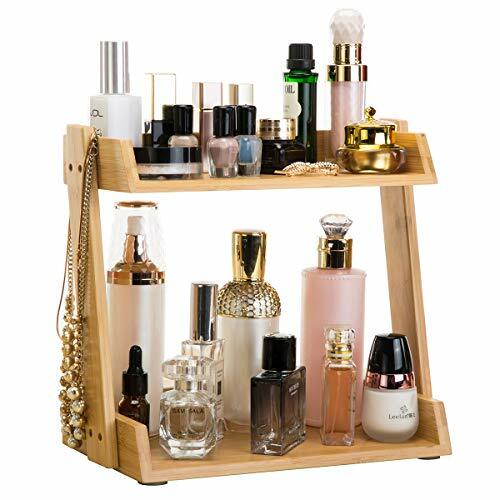 MULTI-PURPOSE: Perfect for storing your makeup, jewelry, office supplies, and more, Display your favorite accessories in bathroom,desktop and dressing table neatly. NEAT & CONVENIENT - Keep makeup and accessories organized and easily accessible - Reduce clutter, save time getting ready, and gain space. Keep Beauty supplies at your fingertips. EASY TO INSTALL & WASHABLE: Quickly assemble and disassemble the organizer following the guide; Use mild soap and warm water.You just need a damp cloth to clean it, and it will make it shine again.Let you no longer worry about cleaning. Made of bamboo resistance to pressure and easy to clean coexist, make use of longer. LIFE TIME GUARANTEE: If you don't think that this is the desirable makeup organizer available , simply ask for a complete and full refund with just one click. Get your money back directly from Amazon - no questions asked. So buy it with confidence. Allowing quick and easy selection to your beauty products without the hassle of searching endlessly from a make-up bag. Keep your everyday essentials in one place, clutter-free, saving valuable time at busy periods.